We have already seen 3D printing used by the E-nable community to create affordable prosthetic hands across the world. Now, Japanese company Exiii are taking the technology even further, creating an accessible, smart bionic arm called Handiii, which, when paired with a smartphone, enables user’s to control its movements with their nerves and muscles. 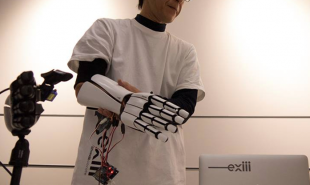 Exiii aim to provide an alternative to the expensive, homogenous prosthetic hands which are difficult to repair or customize. It uses an advanced EMG sensor which collects the electric signals derived from the wearer’s muscle movements and translates them into arm motions via the user’s smartphone. This mean the user can control the device in a natural and instinctive way. Handiii costs only USD 300 and is 3D printed, so it can be produced in a variety of colors and parts can be easily printed and replaced. Initially, the myoelectric hand will be available to research institutions and enterprises, but Exiii are also taking pre-orders directly from consumers. Could the technology be used to create other prosthetic body parts?